Salina Yoon continues her Geisel Honor-winning early reader series starring Big Duck, Little Duck, and Porcupine, perfect for fans of bestselling series like Elephant & Piggie, Ballet Cat, and Pig in a Wig. “[A] wonderfully engaging easy reader. The simply drawn digital cartoon characters exude personality and charm. . . . 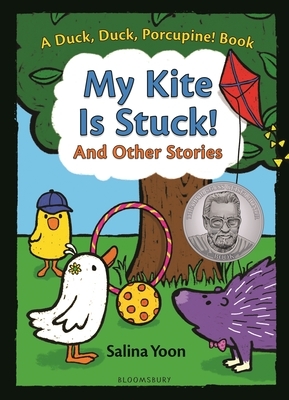 This collection of small dramas is just right for fledgling readers and perfect for read-alouds and reader's theater productions.” —School Library Journal on DUCK, DUCK, PORCUPINE! “A simple chapter book/graphic novel to engage the youngest new readers.” —Kirkus Reviews on DUCK, DUCK, PORCUPINE! “Novice readers will find success here. . . . Yoon's crisp, clean art has a coloring-book-like simplicity that will appeal to youngsters. . . . Kids (and the adults who work with them) can never have too many attractive, well-written beginning readers, and this trio of cuties is a welcome addition to the genre.” —BCCB on DUCK, DUCK, PORCUPINE!